whole cake | Curious Foodie. 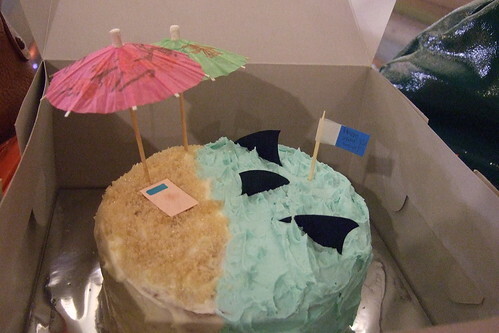 “Beach-Themed” Birthday Cake (Butter Cake With Butter Frosting). First of all, I needed 3 layers of butter cake. Since my oven is a tiny electric one (which bakes less evenly), I baked it in 3 batches. You may freeze the cooled cake for up to 3 months and thaw it for at least 2 hours before you start to decorate the cake. 1. Preheat oven to 175 degrees celsius. Lightly grease a round cake tin (I used a 15cm in diameter tin) and line the base with baking paper. 2. Beat the butter and sugar with electric beaters until light and creamy. Beat in eggs gradually and add the vanilla extract and beat until combined. 3. Fold in the sifted flour alternatively with the milk until smooth. Spoon mixture into tin and smooth the surface. Bake for about 15 to 20 minutes or until a skewer comes out clean when inserted into the centre of the cake. 4. 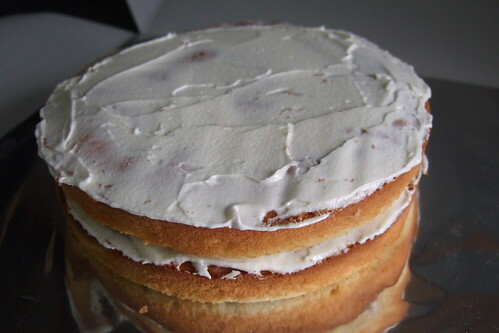 Leave the cake in the tin for about 5 minutes before turning it out onto a wire rack to cool completely. And then…Viola. My butter cake layers thawing from the cold of the night. 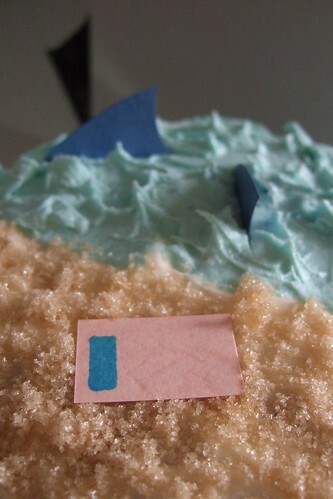 Here’s my blue frosting for the ‘sea waves’ using this from allrecipes. For this cake size, I changed the total frosting portion to 18. I used a drop of blue colouring to mimic the waves. For the ‘sand’ portion of the cake, I added less icing sugar to the frosting as it would be topped by brown sugar and I wanted to it look less stiff. 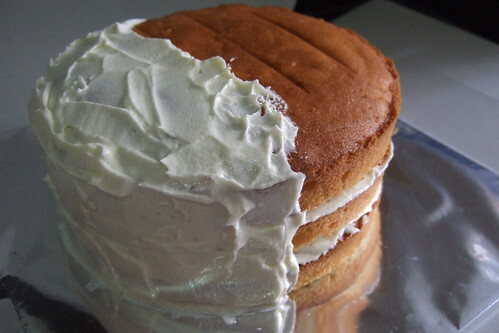 Layer 1 and 2 of the cake frosted with the ‘sand’ frosting. I would use whipped cream with fresh strawberries as a filling next time. 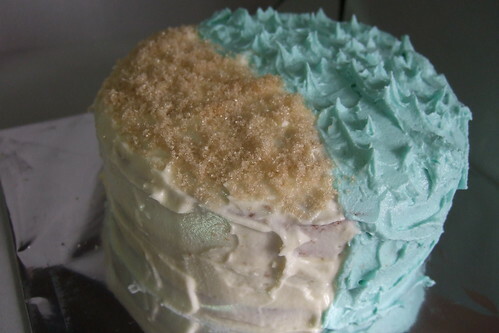 The sand portion all frosted. Little beach mat I made, near the sharks. *Shudders. 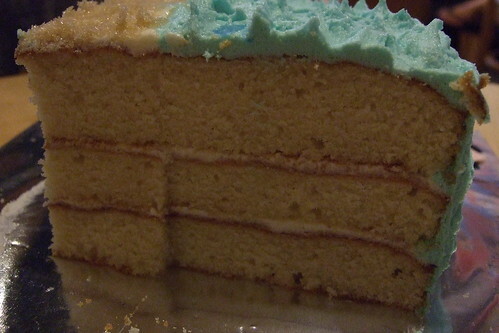 Here’s how the inside of the cake looked like. 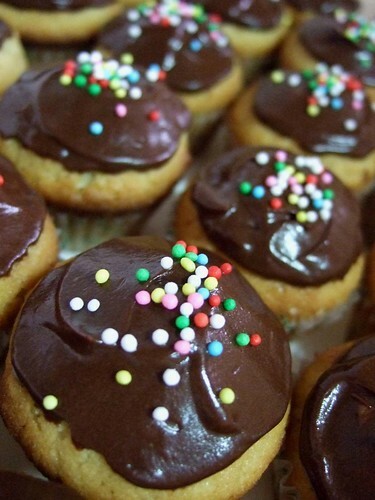 Muffins & Cupcakes: Why they are different. I found a lot of talk and misconceptions about the similarities and differences between a muffin and a cupcake online. Some say a muffin becomes a cupcake when there is frosting on it. Some say that cupcakes are smaller than muffins. That is incorrect, here is my take on it. Let’s conquer the cupcake first. A cupcake is essentially the same as a whole cake. It is simply baked and served in a portion to serve one individual. 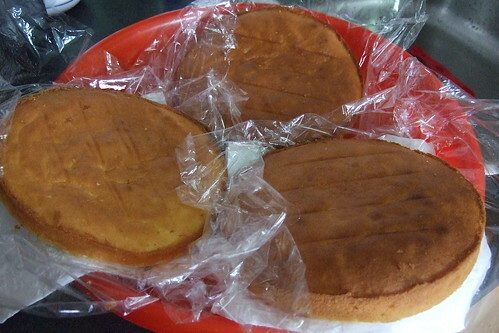 It is usually frosted (like those in the photos above) and decorated. 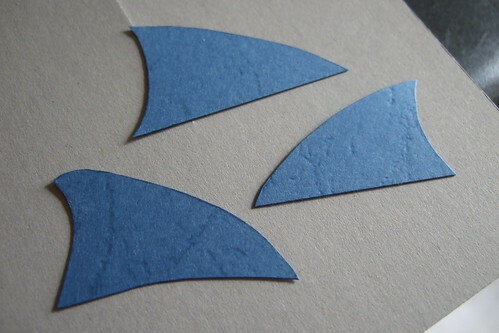 It is common to see it at birthday parties and weddings. 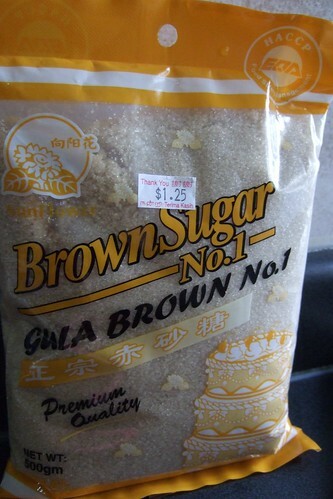 It is sweet and hence eaten mostly as a dessert or a sweet treat. An un-frosted cupcakes does not equate to a muffin. 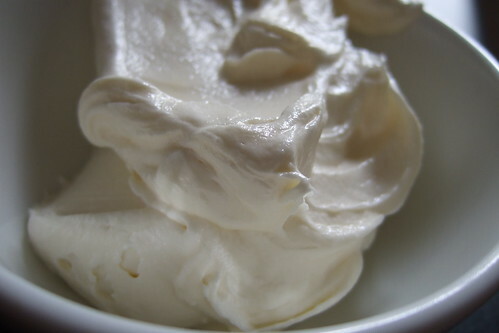 Butter is usually used in a cupcake recipe. Conclusion: A cupcake is a cake. A muffin is one of the easiest things to bake (although I’ve had my fair share of failures, will give you tips to succeed in baking a muffin). It is simply mixing the wet and dry ingredients together and some recipes do not even require the use of an electronic beater or whisk. It can be frosted or not frosted. For fruit muffins, I like to use a crumble on top (recipe in the next post). It can be sweet or savoury and is mostly eaten during breakfast or tea. A frosted muffin does not equate a to cupcake. Oil is usually used in a muffin recipe. 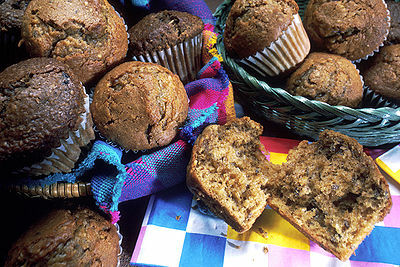 Conclusion: A muffin is a type of bread (quick bread). I hope this clarifies the difference between a cupcake and a muffin better. Watch out for my next post on my experience with baking muffins. Peanut Butter Frosting With Chunks of Nuts Recipe. I love peanut butter, especially those with chunky peanuts in them. I am so glad I do not have Arachibutyrophobia (fear of peanut butter sticking to the roof of the mouth). 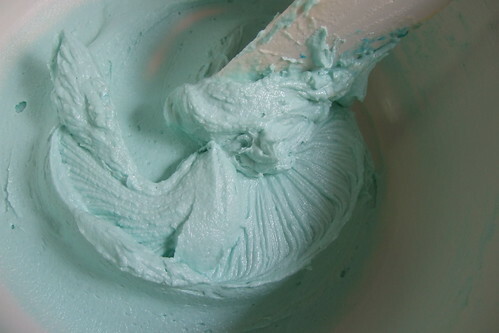 Here’s one of my favourite frosting recipes. 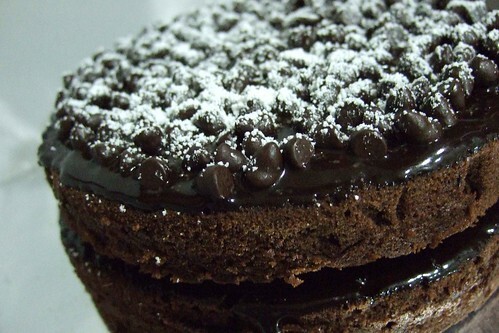 I use it for my chocolate cupcakes, it is always a perfect combination. 1. Place butter and peanut butter into a medium bowl and beat with an electronic mixer. 2. 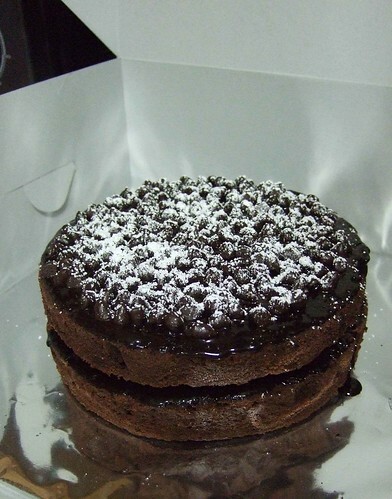 Gradually mix in the confectioner’s sugar till it starts to get thick. 3. Add milk and mix well until all of the sugar is mixed in and frosting is thick and spreadable. 4. Beat for at least 3 minutes for it to get fluffier. Anyway if you’re really into baking with peanut butter, here are more recipes for you from Skippy. 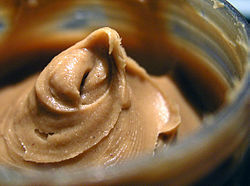 Here is one weird fact I found from another blog about peanut butter. You cannot really find it in the UK except in certain specialty stores. Is this really true?